Event #16: $1,500 No-Limit Hold'Em 6-Handed has come to an end with Anthony Marquez emerging as Champion. Marquez defeated Demosthenes Kiriopoulos in heads-up play after assuming a massive chip lead when he scored a double knockout to enter the duel. Kiriopoulos took home $242,978 for his efforts. In the final hand of the night, Marquez was able to get all of the chips in the middle with versus Kiriopoulos' when the flop came ten-high. The board ran out clean for Marquez, and Kiriopoulos was eliminated in second place. Marquez explained that he has always been a cash game player, predominantly limit, and once the big game dried up in Los Angeles, he turned to tournaments. His total live earnings before this win were just above $150,000, and he has now more than quadrupled that. "It's every poker player's dream to win a bracelet," said Marquez. He added that he will most definitely be playing in more tournaments now that he's "on a roll." 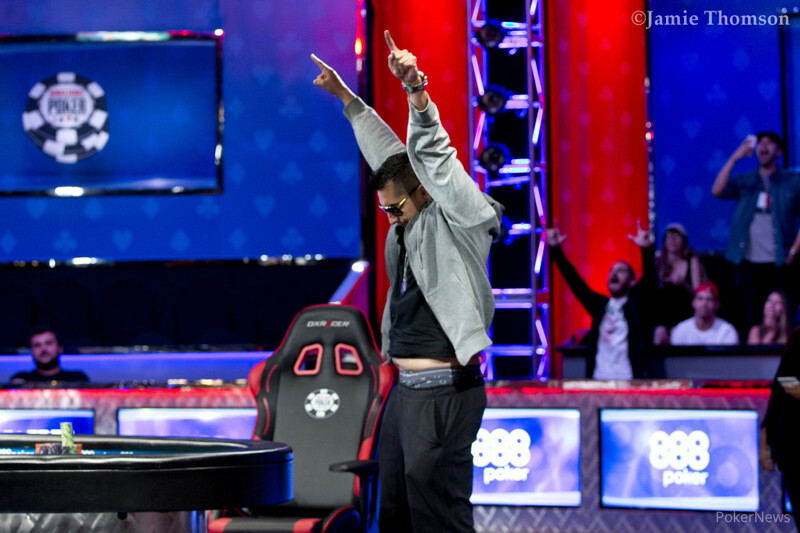 Marquez steamrolled through the final table, ending up with a five-to-one chip lead against Kiriopoulos when heads-up play began. He ended the tournament with a massive rail of support behind him and was all smiles while surrounded by friends and family. The tournament started with a total of 1,748 entries, compiling a prizepool of $2,359,800. There were 263 players that made the money and were guaranteed a cash prize of $2,247. The bubble burst early in Day 2 with tons of short stacks being eliminated within the first two levels. Some of the notables to finish in the money include Ismael Bojang (8th place - $46,887), Matt Stout (18th place - $20,434), Layne Flack (23rd place - $15,919), and Justin Bonomo (41st place - $8,187). The final table started with seven players but was soon dwindled down to the final six with the elimination of Royce Matheson (7th place - $46,887). Matheson became the short stack on the table and was at risk in a dominated position against Berkey. He couldn't get lucky, and that set up the official final table. Just two hands into six-handed action, Ilkin Amirov (6th place - $63,506) busted with against the of Demosthenes Kiriopoulos. There were more than 60 hands until the next elimination, which came at the expense of Matt Berkey (5th place - $87,141). Berkey flopped a combo draw in his last stand but could not overcome Marquez's top pair. On Hand #97, in what turned out to be the hand of the night, Steven Buckner (4th place - $121,114) and Daniel Weinman (3rd place - $170,477) were eliminated at the same time. Buckner held pocket jacks and Weinman pocket kings, but it was Marquez's ace-king that made a straight on the river. Once the hand was over, Marquez held a massive chip lead going into heads-up play with over 10 million chips. That wraps up the coverage for this event, but there is plenty more left this summer, so stay here with PokerNews for all the latest updates. 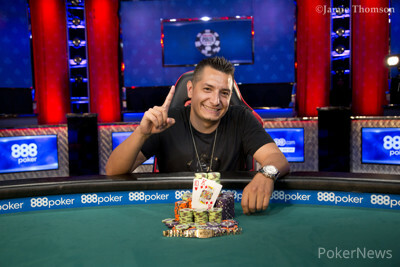 Anthony Marquez is victorious in event 16, the $1500 No-Limit Hold'em 6-Handed tournament and captures his first WSOP gold bracelet. Hand #122: Anthony Marquez raised to 350,000 on the button, and Demosthenes Kiriopoulos called. The flop came , and Kiriopolous checked. Marquez bet 350,000, and Kiriopoulos moved all in. Marquez called. Kiriopoulos was at risk with and was well behind Marquez's . Everyone was on their feet as the hit the turn. The river was the , and it was all over. 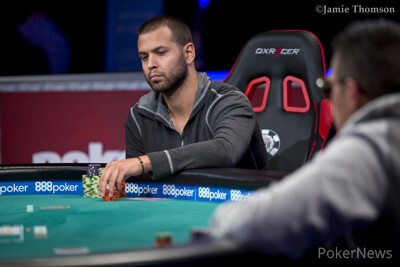 Kiriopoulos was eliminated and finished as the runner-up, pocketing $242,978 for his efforts. Hand #119: Demosthenes Kiropoulos moved all in, and Anthony Marquez folded. Hand #120: Kiriopoulos got a walk. Hand #121: Kiriopoulos limped in, and Marquez checked his option. The flop came , Marquez bet 250,000, and Kiriopoulos folded. Hand #112: Anthony Marquez raised to 300,000, and Demosthenes Kiriopoulos folded. Hand #113: Kiriopoulos limped the button, and Marquez raised to 350,000. Kiriopoulos moved all in for 2,250,000, and Marquez folded. Hand #114: Kiriopoulos got a walk in the big blind. Hand #115: Kiriopoulos called on the button, and Marquez raised to 350,000. Kiriopoulos called and saw the flop of . Marquez bet 555,000, and Kiriopoulos folded. Hand #116: Marquez raised to 300,000, and Kiriopoulos folded. Hand #117: Kiriopoulos limped the button again, and Marquez raised to 350,000. Kiriopoulos folded. Hand #118: Marquez raised to 250,000, and Kiriopoulos called. The flop came , and both players checked. The turn was the , and Marquez bet 350,000, which Kiriopoulos called. The river brought the , and Marquez 550,000. Kiriopoulos folded. Hand #107: Demosthenes Kiriopoulos limped in, Anthony Marquez raised to 340,000, and Kiriopoulos folded. Hand #108: Marquez limped in, and Kiriopoulos checked. The flop came , and both players checked. The turn was the , and Kiriopoulos led out for 100,000. Marquez raised to 350,000, and Kiriopoulos folded. Hand #109: Kiriopoulos limped in, and Marquez raised to 275,000. The flop came , Marquez bet 400,000, and Kiriopoulos folded. Hand #110: Marquez limped in, and Kiriopoulos checked. The flop came , and Kiriopoulos check-called a bet of 80,000 from Marquez. The turn was the , and both players checked to the river, which was the . Kiriopoulos bet 200,000, and Marquez snap-called. Kiriopoulos tabled for eight-high, and Marquez tabled for jack-high to scoop the pot. Hand #111: Kiriopoulos limped in, and Marquez checked. The flop came , and Marquez bet 80,000. Kiriopoulos called. The turn was the , and Marquez check-called a bet of 200,000 from Kiriopoulos. The river was the , and Marquez check-called a bet of 300,000 from Kiriopoulos. Kiriopoulos tabled to take down the pot. Hand #103: Demosthenes Kiriopoulos limped on the button, and Anthony Marquez raised to 380,000. Kiriopoulos called, and they saw the flop come . Marquez checked, and Kiriopoulos bet 250,000. Marquez called, and the came on the turn. Kiriopoulos moved all in for 1,100,000, and Marquez folded. Hand #104: Marquez raised to 220,000, and Kiriopoulos called. The flop was , and Marquez bet 225,000. Kiriopoulos called and saw the on the turn. Kiriopoulos led out this time for 350,000 to win the hand. Hand #105: Kiriopoulos called on the button, and Marquez checked. The flop was , and Kiriopoulos bet 80,000, taking down another pot. Hand #106: Marquez called on the button, and Kiriopoulos checked. The flop came , and Marquez bet 100,000, which was called by Kiriopoulos. The turn was the , and both players checked. The river landed the , and Marquez took down the pot with a bet of 380,000. Hand #98: Anthony Marquez raised to 240,000 on the button and got no action. Hand #99: Demosthenes Kiriopoulos limped in, and Marquez checked his option. The flop came and Marquez check-called a bet of 80,000 from Kiriopoulos. The turn was the , and both players checked to the river, which was the . Marquez led out for 300,000, and Kiriopoulos called. Marquez tabled for two pair, and Kiriopoulos rolled over the same hand with for the chop. Hand #100: Marquez raised to 180,000 on the button, and Kiriopoulos called. The flop came , and both players checked through the turn. The river was the . Kiriopoulos led out for 180,000, Marquez raised to 560,000 and Kiriopoulos folded. Hand #101: Kiriopoulos called on the button, Marquez raised to 290,000, and Kiriopoulos folded. Hand #102: Marquez raised to 320,000 on the button, and Kiriopoulos folded. "How Good Do You Run, Bro?"